Flatfoot is often a complex disorder, with diverse symptoms and varying degrees of deformity and disability. 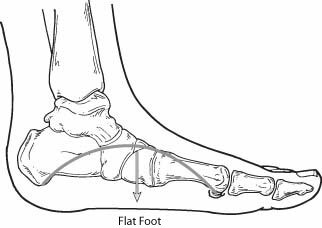 There are several types of flatfoot, all of which have one characteristic in common: partial or total collapse (loss) of the arch. Bunions and hammertoes may develop as a result of a flatfoot. 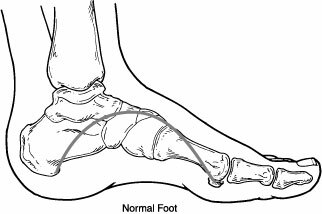 Flexible flatfoot is one of the most common types of flatfoot. It typically begins in childhood or adolescence and continues into adulthood. It usually occurs in both feet and progresses in severity throughout the adult years. As the deformity worsens, the soft tissues (tendons and ligaments) of the arch may stretch or tear and can become inflamed. The term “flexible” means that while the foot is flat when standing (weight-bearing), the arch returns when not standing. Low back, hip or knee pain. In diagnosing flatfoot, the foot and ankle surgeon examines the foot and observes how it looks when you stand and sit. X-rays are usually taken to determine the severity of the disorder. If you are diagnosed with flexible flatfoot but you don’t have any symptoms, your surgeon will explain what you might expect in the future. Activity modifications. Cut down on activities that bring you pain and avoid prolonged walking and standing to give your arches a rest. Weight loss. If you are overweight, try to lose weight. Putting too much weight on your arches may aggravate your symptoms. Orthotic devices. Your foot and ankle surgeon can provide you with custom orthotic devices for your shoes to give more support to the arches. Immobilization. In some cases, it may be necessary to use a walking cast or to completely avoid weight-bearing. Medications. Nonsteroidal anti-inflammatory drugs (NSAIDs), such as ibuprofen, help reduce pain and inflammation. Physical therapy. Ultrasound therapy or other physical therapy modalities may be used to provide temporary relief. Shoe modifications. Wearing shoes that support the arches is important for anyone who has flatfoot. In some patients whose pain is not adequately relieved by other treatments, surgery may be considered. A variety of surgical techniques is available to correct flexible flatfoot, and one or a combination of procedures may be required to relieve the symptoms and improve foot function.